It’s appalling how many 30-somethings (or even younger) are settling for “what is,” and completely ignoring what could be. Worse than that, 30-somethings can’t comprehend how other 30-somethings can accomplish long-held dreams—or even worse than that, us 30-somethings sometimes judge and criticize those who pursue those dreams. I saw this nine years ago when my husband and I fulfilled our dream of a cross-North America road trip. I saw it again when I decided to become a writer. I saw it again when we packed all three kids on bicycles and went on a 557-kilometer adventure. And I see it more and more in conversation, both in person and online. I believe that if you truly want something, the first step in achieving it is to change your mindset. Why do we 30-somethings think “we’re too old” for anything? My 82-year-old grandmother used to hop on a bus, go to the movie theatre, move from room to room watching all the movies, then hop on the bus and go back home. She used to beat her chest and say “age is what you feel in here.” And goodness, was she ever young. My other grandmother, now 88, owns an iPad and chats with people on Facebook. None of us are too old for anything—and nothing is impossible. If there’s something you really want, make a plan to make it happen. I’ve said it before, and I’ll say it again: a dream is only “just a dream” until you make it into a goal. After that, it’s only a matter of time and planning before it becomes reality. I’ve been telling myself that statement for years, and it’s not always easy. But when there’s something I really want, and I no longer want it to be just a dream in the far-off future, I start taking action to make it happen—despite all the naysayers, all the obstacles, and all the people who might say I can’t. I choose to ignore the status quo and live life on my own terms. And it’s worth it. Every time I’ve gone ahead with a dream, only good things came of it. And even when those dreams didn’t turn into much, they provided excellent learning experiences. Recently, I accomplished another goal, which had once only been a dream. When I was in high school, I took a theatre performance class, and I absolutely loved it. I really wanted to be in a play, but as immigrant teenagers often do, I worked long hours and was never able to commit to the rehearsal schedules for any plays. Well, at 34, after three kids, I was finally able to participate in a play! I met a local community theatre director through face painting at our lovely town’s many festivals, and I mentioned that I had always wanted to be in a play. She invited me to be in one a few months later. I could have said it was too late, or found a million excuses not to do it. But I knew that it’s never too late to fulfill a dream, and you shouldn’t dismiss an opportunity when it falls at your feet. So I accepted the role and acted in a play based on one of my favourite books/movies – The Princess Bride. I played a man, the Sicilian mastermind behind the kidnapping of the Princess. I had such a blast and couldn’t wait to be in my next play. I love acting, and of course I said yes the next time the same director asked me to be in a play. This time, she gave me a bigger part! I was soooo excited to be doing this. I had an absolute blast playing the villain (again!) in a new iteration of Sleeping Beauty. The play was funny and fresh, and it felt so wonderful to hang out with a bunch of lovely people doing one of the things I love doing: acting. Better yet, not only did I get to act, I also got to choreograph this play. I also helped out with making the programs and keeping everyone informed about extra rehearsals, etc. In other words, I was able to have a full community theatre experience, all because I refused to tell myself that it was too late or that I was too old to pursue a long-held interest. Minions rehearsing the choreography I put together! I have realized I love acting so much that I’d really love to pursue it more seriously. I could sit here and say “I’m too old to start something new,” or “it’s not the right time because I have children,” or “that’s not what I wen to school for,” or a number of other excuses. Yes, excuses, because that’s what they are. When you really want something, you find a way to make it work. Yes, perhaps it’ll look a bit different in different stages of life, but that doesn’t mean you give up all together. I’m not going to be moving to L.A. or Vancouver or even Toronto to pursue acting. My husband has a steady job and we can provide well for our children. We have other dreams that we’re currently turning into goals as well. But all that means is that I find a way around our current life situation to continue pursuing something I truly enjoy. For now, that means community amateur theatre. A hobby for which I don’t get paid, but that gives me some amazing experiences, lets me meet new friends, and allows me to work on my craft. I’m also taking an acting class with a local actor, which is allowing me to improve my acting skills and to meet others who share my interests. I’ve also signed up for a casting call service that will let me know when there are opportunities to participate in student films and other projects. Far too many of us, at far too young an age, give up on dreams we once held dear. Why do we do this to ourselves? To keep up with the rat race? To keep up with the Joneses? Why do we convince ourselves that “this is life” and that we have to do things the way everyone else does them? The truth is, giving up on dreams becomes what’s comfortable for us. Except that for many, it’s only comfortable on the surface. There’s still that little nagging voice telling us we could be doing more, we could be more. For me, this realization came early: when my husband and I decided to set out on that 2-month road trip through North America. There were plenty of naysayers. I was 26 then, and I knew the dreams that were worthwhile to me would not necessarily speak to others. But I couldn’t let the naysayers stand in the way of accomplishing what I knew I was capable of accomplishing. I went through this again when I decided to become a writer, and again when we set out on our cycling adventure. I’m sure I’ll face many naysayers through every other endeavour I decide to pursue, including acting. But that doesn’t matter. I won’t lie. Sometimes it’s hard to ignore those naysayers. Especially the ones who don’t understand my multi-faceted nature and my need to always be involved in many different things. But the rewards I get from pushing through and following my interests far exceed any stamp of approval I might get from doing what society expects me to do. The thrill of learning something new, of setting out in a new direction, of learning from others, and from being everything I can be in every area I desire to set out into… that will never pale in comparison to any pre-approved behaviour patterns. What have you told yourself you’re too old to do or it’s too late to try? Why have you told yourself this, and what change will you make today to make sure that your dreams actually happen? Let me know in the comments. So glad! What goal will you accomplish next? This is a great motivation. I am in mid 30s and my passion are resonating in my inner self. Yet here’s the negative mindset telling me that it’s too late. But, NO!!! It’s never too late. All I need is to feed positive and good motivations like this blogpost to remind me that following passion has no age limit. Thanks for this. I always feel like I’m to old to start something that people usually start a lot younger. Now when I start thinking that way, I’ll remember this post. this is so true! there are so many things that i think about doing, but quickly write off because of my age. love that you did the play and the trip. so cool! This is so inspiring! 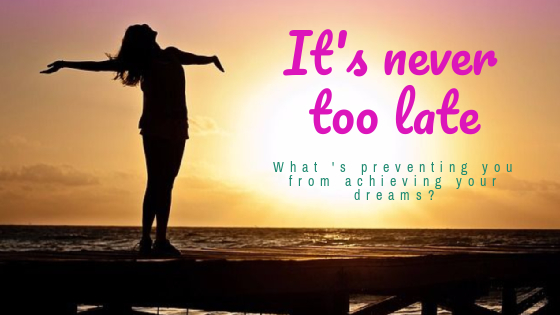 You are completely right, it is never too late! I believe it is important to follow dreams. I can’t wait to see what the next adventure will bring you :)! What a great attitude! If you are still alive, It is not too late. It’s important not to give up on dreams no matter our age. Lol my grandma has an ipad to. Crazy how things change. I’m so glad I found your blog! I love this post, and I agree with you completely. It is never too late to be who you want to be or live your best life! I believe that the more good we give out into the world, the more good we get! Be happy and happiness will always find you! It is never too late to start something new. I think I start something new in my life every couple of years so it seems. Pingback: From Scatter Brain to Hyper-Organized: How I Use Mind Maps for Content Creation – Create content.